Wow! Thats all that can be said about the fishing in this month of October. We have been fortunate enough to have multiple fish days (20-30) multiple times so far. We have had a few cool downs that has really turned the bite on. Bait is not necessarily an issue right now for anyone fishing our area. Guides tend to use Pilchards and Pins but with the fishing the way it has been there is plenty of options. Shrimp, to Cut bait has all been producing. 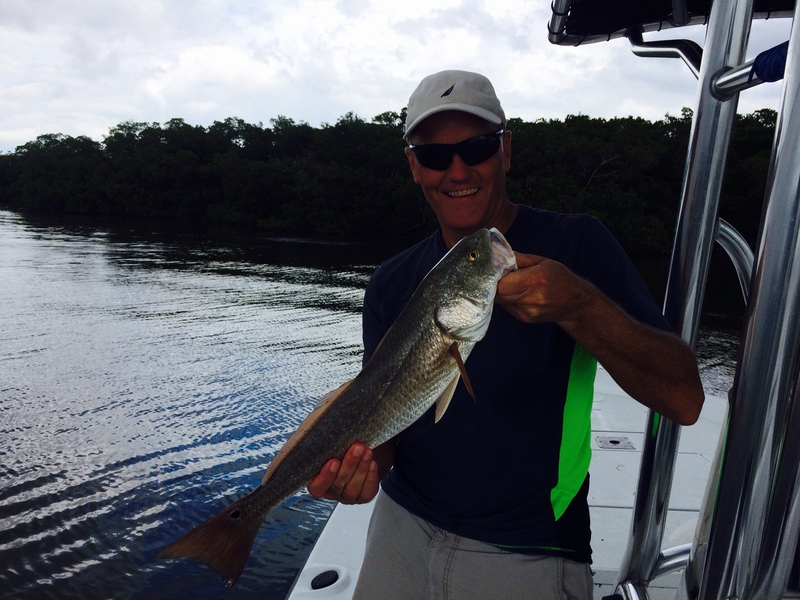 Reports from other area captains have even been as good as catching 32 redfish on CUT BAIT! Thats a sign that the fish are pretty much eating anything right now! The higher tides have been slightly better than the lows but fish can be found on either. When fishing a low tide you have a couple options, either fishing a grass flat or staying close to passes is a couple good ways to ensure success. If you decide to fish a flat be sure you have a boat that can get skinny, the water falls quick and you dont want to be stuck high and dry waiting hours for the water to come in. If you’re fishing a flat the absolute best advice anyone can give you is to find life on the flat. Mullet, bait fish, any type of life is a good sign and usually a starting point. The passes are usually synonymous with structure. Mangrove edges, docks any type of heavy structure will hold Snook as well as other species like Jack Crevalle. Either tail hook a pinfish or nose hook a pilchard free lined in to the docks and mangroves and you will be in the best place for a hook up. Look for Triple tail fishing to heat up with the recent start of Stone Crab season in our area! Be sure to check out our Facebook page for recent updates and tips.